While the holidays draw near, anyone tasked with gifting turns their mind toward packaging at some point. While wrapping paper still reigns supreme, there's another option available. A more eco-friendly option, we might add. Gift boxes, especially unique boxes, can be all the decoration a gift needs this holiday season. Custom gift boxes aren't a new idea, but they've long been the domain of luxury packaging. Think of Tiffany's jewelry, for example. Sparkly diamonds might come to mind, but so does their iconic robin-egg blue box and white ribbon. In that example, their brand is clear. So much so that a Pinterest marketing effort proclaims, "There is no color quite like this." When A/Z Corporation approached us to create custom gift boxes for them, we knew it was an opportunity to build something great. As a company that markets itself as an innovative leader in their field, it was important to match that flair. To match the clean aesthetic of the organization, the set-up box style was chosen. Two piece set-up boxes are often used for high-end electronics, like smartphones and tablets, so there is an implied sense of luxury for the user. 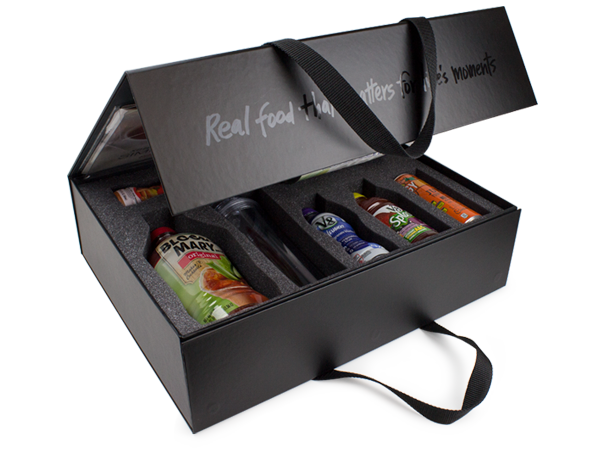 To enhance the rigid box, we wrapped it in a black ultima. This cover material is rich and gives both depth and contrast when used. Particularly with finishing elements that set it off, like silver foil stamp crowning the package with A/Z Corporation's logo. Watch the video to get a sense of the unboxing elements. Minnesota-made packaging at its finest. While we love this project, there are more things that could enhance it further. A thermoformed insert, or custom foam insert, could add additional protection. 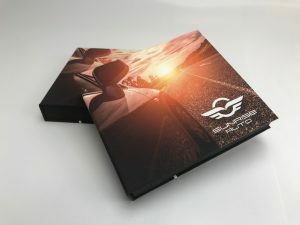 And while the rigid two piece setup box is fairly well protected, adding a sleeve to the box adds more real estate for marketing content without ruining the sleek, clean look. But that's just us working toward perfection. While the setup box style was perfect for this project, there are many, many other styles of custom boxes that you can peruse to find the perfect one for your product and organization. While you might not initially think of your product as a gift to customers, using a little bit of that aesthetic could bring a new dimension to your brand. Sunrise Packaging creates boxes that can be used as keepsakes. It's the time of year when generosity is infectious; give your customers a thank-you that's stylish and attractive. Contact us today for a quote! Nostalgic Packaging: Throwback or Throwaway? Nostalgia sells, and nostalgic packaging plays a big role in that. Utilizing elements from popular design trends of the past is a powerful tool on its own. Certain fonts and colors, image stylings, and more can evoke strong emotions in people. It's becoming increasing popular for products ranging from shoes to soft drinks to market throwback styles or recipes. These tactics allow former customers to re-engage with a product while allowing a new generation to discover it. In our image-saturated world, something that can grab and hold attention--especially if it's due to resonating with the viewer--is a win for marketers. As more and more brands jump on the throwback bandwagon, it becomes clear that execution plays a big part in how well a product is received. Fast Company detailed how different brands are optimizing product launches with success or...less than success. First off, we love nostalgia in the USA. Which explains why adults might love to shell out money for shoes they always wanted as a child, like the Adidas relaunch of Stan Smiths. But why do millenials and Gen Z seek out retro designs and references? Turns out, it's just part of an ongoing cycle. Generations are constantly rediscovering past generations. Resurrecting past trends starts with groups creating demand for products that are generally hard. And from there others learn about it and want to recreate the experience. The demand for vinyl, or records, in the past few years is proof of this. While it's infinitely more convenient to stream a curated playlist from a smartphone, people crave the experience that goes with listening to an album from start to finish, reading liner notes, viewing album art. The resurgence of Polaroid and Fujifilm instant photos is another example. Products and nostalgic packaging that can tap into the collective cultural memory are the most effective. So much so that some organizations have taken to hiring a kind of 'chief memory officer.' Their primary task? Sorting through company history and culture to reference for product and campaign launches. When it comes what not to do, the answer is easy: don't force a trend. It's can be risky to bring back an old packaging style without an existing desire for it. But when it comes to custom packaging design, there are plenty of elements to implement to match a design from days of yore. Ready to dig into the past and find a style of nostalgic packaging that works for you? Contact Sunrise today! This time of year seems to bring out the best in people. We're inspired by the holiday season to give more, volunteer more, and appreciate what we have a little more. And when we get to create custom pads for an organization that literally embodies these sentiments, like the Salvation Army, it drives that point home even more. You've undoubtedly encountered a Salvation Army volunteer or two ringing bells outside businesses to get donations. But donating your spare change while hurrying out of the grocery store isn't the only way to help the organization. Planned giving is a major source of funding. To attract new donors in this digital age, the Salvation Army knew they had to move past the analog style of a brochure. Custom pads are the perfect option. Sunrise Packaging custom pads are sleek, booklike boxes. We use a heavy chipboard for extra impact, and a custom foam insert to hold contents in place. They're the perfect option for a variety of products, from loyalty cards to medical devices to flash drives. And whatever might be part of the financial plan of the donor. Additionally, a clear vinyl sleeve was added to the custom pads. This will hold a brochure, postcard, and a business card. Custom pads are a great accompaniment to marketing campaigns. They can appeal to those who like to physically handle materials while offering an alternative for those who want to interact through technology. 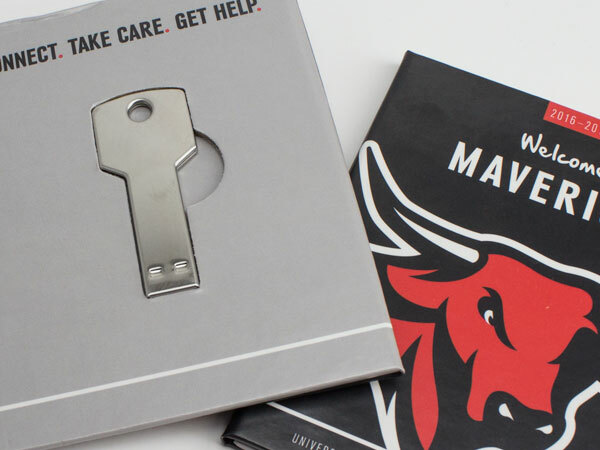 Not to mention that the personalized USB drives can cleanly transfer documents necessary for giving campaigns. Additionally, custom pads can even come with a creative sleeve for mailing. Learn more about options for design and finishing by reaching out to our sales team today! Buying a car is, for most people, a process. From the financial considerations to what options are most important, it’s a decision-laden process. Not to mention stressful. At the end of the road, customers want to feel confident in the decisions they’ve made. As they drive off the lot, car dealerships should recognize that there is always another opportunity for car marketing. Key fobs are practically a standard in vehicles today. The use of the fob might vary, from just unlocking the car to starting it remotely, but there’s usually two identical fobs. One on the keys, and a spare. The spare is usually handed over, fairly unceremoniously, in an envelope. Which may or may not feature the brand. 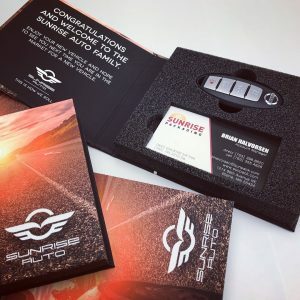 Sunrise Packaging (Blaine, Minnesota) recently started working with car dealership marketing teams to create a kind of welcome kit for customers. This kit affirms that they’ve made a great choice not only in their vehicle, but choosing the dealership as well. It boosts confidence and makes customers feel secure. Construction: these pads utilize custom thermoformed foam inserts to keep the fob and business card firmly in place. They’re also tied together in the customer’s mind. The pad construction, mimicking our FlashPads, is sturdy like a hardbound book. Design: car marketing is all about impressions and prestige. We’ve designed a packaging solution that’s intuitive and attractive. Sunrise can design with your brand in mind, and take your vision to the next level. Content: from the visuals to the words, there’s a message here. It’s adventure on the open road. It’s a warm handshake. A possible future referral for your dealership. Keep it simple, but significant. Additionally, these FobPads are keepsakes for the customer. The fob is safe in a recognizable space, ensuring that it’ll be kept in the house for a long time. New cars come out all the time. Dealerships exist in nearly every town in America. What makes your dealership stand out? We know pricing and financing are one thing, but it really comes down to dealership and car marketing. As a family welcomes a new car into their life, so can a dealership welcome them to their family. Be one of the early adopters in this exciting new opportunity. Contact Sunrise today to start! Some rules of marketing apply to all sectors, but when it comes to niche industries, like casinos, the rules are different. While a health organization has no problem promoting health, casinos typically don’t promote excessive gambling. It leads to creative angles that tap into different areas of the subconscious. One area in which this is evident is in casino packaging options. The goal of any casino is to bring in players. It’s no coincidence that many casinos use magnetic cards to run… Well, everything. These cards make it easy to move around the space, from checking in to rooms to paying for meals to gambling. They also enable casinos to know exactly where you are and what you’re spending. Casinos are pros when it comes to using data to inform marketing decisions. And if you’re a major spender or high roller, there’s an incentive to keep you on the premises. And to get you to return ASAP. And that’s the tip of the iceberg. Savvy casinos are using this mountain of data to market to their desired client base to draw them in for special events, offers and more. It’s about meeting their needs before they know they need or want something. 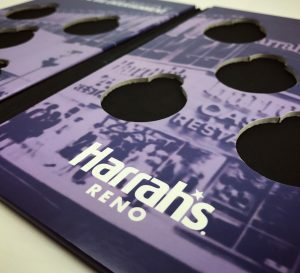 In the image to the right, the project we completed for Harrah’s Reno Hotel plays on a few marketing tropes specific to casino packaging. To engage high rollers and provide them with something unique, we created personalized packaging to hold limited edition poker chips. These custom pads utilize luxury packaging detailing. They flip open, evoking an exciting hardcover story book, revealing a present designed to appeal to high rollers. Casino packaging like this can be customized with die cuts to hold loyalty or membership cards, keys, poker chips, or other souvenirs. Branded with your organization’s colors and logos, this style of customized packaging is designed to enhance the customer experience. All industries want to keep and retain their customers. But for casinos, the payoff from customer loyalty is what drives the bottom line. Finding ways to please and delight them–and create incentives that keep them coming back–is the best way to earn their loyalty. Contact Sunrise today to learn more about designing effective casino packaging!